For years I have received De Nederlandsche Leeuw [The Dutch Lion], the journal of the Koninlijk Nederlandsch Genootschap voor Geslacht-en Wapenkunde [Royal Dutch Society for Genealogy and Heraldry], published since 1884 in The Hague. I scan each issue for any scraps on the ancestry of the settlers of New Netherland in the seventeenth century. Sometimes there is an article on a family that emigrated to the United States in the nineteenth century or had American connections. In the September 2017 issue (vol. 134, no. 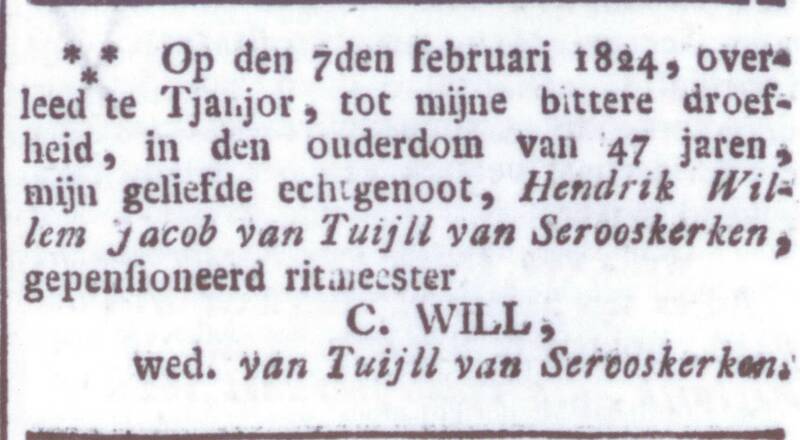 3), at pages 143–60, is a fascinating and complex article, “Hendrik Willem Jacob van Tuyll van Serooskerken (1777–1824) en zijn tweede echgenote Catherine Halsey geb. Will (1780–1841).” The author, C. P. Briët, shows that Hendrik Willem Jacob van Tuyll van Serooskerken, a divorced Dutch baron, married in 1818 or 1819, perhaps in Philadelphia, Catherine (Will) Halsey, the American widow of an Englishman, Charles Herman Halsey, by whom she had three children. She and the baron had one child, Louise Henriette, born in 1819. The couple then moved to the Dutch East Indies, where the baron died in 1824. Catherine must have many descendants who are unaware of their fascinating ancestry and connections. Catherine’s oldest daughter, Catherine Henriette Halsey, married a Dutch officer in 1823 in Jakarta and they returned to the Netherlands. Catherine’s second daughter, Anna Maria Halsey, married in the Dutch East Indies in 1825, Joseph White of Salem and Boston (1791–1867). The couple soon returned to Massachusetts, and they had several children. Catherine and her youngest daughter, Louise Henriette van Tuyll van Serooskerken, returned to the United States in 1825. Louise married in Cranbury, Middlesex County, New Jersey, in 1838, William Schenck, and they had several children. Her mother, Catherine (Will) (Halsey) van Tuyll van Serooskerken, died in 1841 and was buried in Cranbury. Catherine must have many descendants who are unaware of their fascinating ancestry and connections. Her Halsey children had English gentry ancestry through their father; her daughter Louise had multiple noble and royal lines through her father. The article is brilliant, and the author’s command of American sources is impressive. He includes substantial biographical material about the baron, Charles Herman Halsey, and Joseph White, and several illustrations. I have Dutch ancestry, but have no hope of reading Dutch. Is the journal you cite also available in English? For the most part, it looks like my European ancestors emigrated straight to North America. I get hints that some of them lived in the Caribbean at some point. How common was it for Europeans (or Americans) to reside there before moving on? I find genealogie.org helpful. The site is in Dutch, but you can choose translations in English, German, and French. Many of those records are appearing on MyHeritage. From The Netherlands to New Amsterdam (New York) or New Jersey to The Dutch West Indies and back to North America was not uncommon in the lucrative trade years, especially in the 1600s through mid 1700s. What province is your family from? When did they come to America? Where did they settle? I have researched my Dutch heritage. Perhaps I have something to share with you. Interesting. TKU for another source. My family , the Longstreet’s (Langstraats?) and Lane’s (Lanen van Pelt) came to Monmouth County, New Jersey . Finding information was helpful from a magazine called “New Netherland Connections”. The Aumack /Amach family has not been quite as easy. My only suspected Dutch ancestor, Van Tyle(?) came to America prior to 1765. My Dad, who descends from this person, has atDNA matches who live in the Netherlands or who have what appears to be all Dutch ancestry. 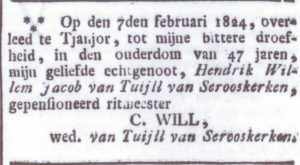 This story shows how New England and Dutch lines might have resulted in matches who live in the Netherlands today. Thank you for sharing this bit of history. Thank you the posting, which will make another family to be added to Gary’s 600 (or will it be 700) Royal Descendants! I wish to note additional ENGLISH connection withe the Killigrew and Wroth marriages. 2nd or 3rd sons marrying English girls for the dowry, per chance? Nice story, Henry! Thank you!